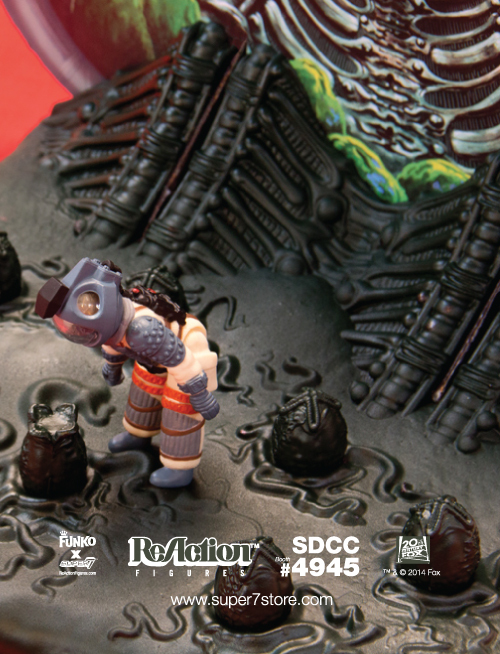 Angry Koala Gear: Super7 Lineup for SDCC 2014 Including Alien ReAction Figures and More! 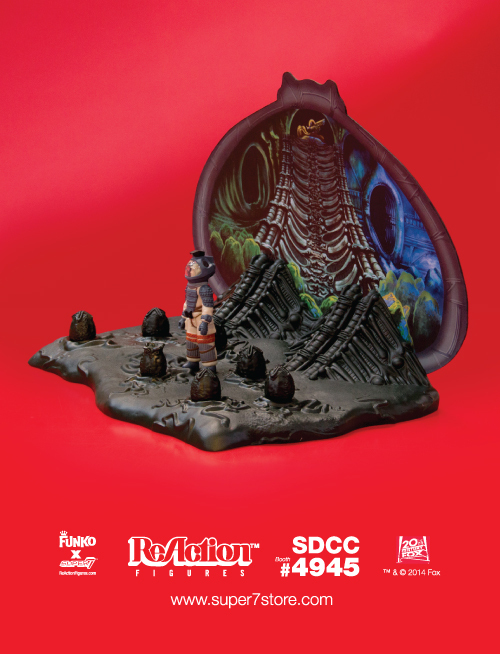 Super7 Lineup for SDCC 2014 Including Alien ReAction Figures and More! In San Diego no one can hear you scream! It is nearly time for the most epic convention to end all conventions of the greatest things comic, sci-fi, fantasy, toy, game, and more! As always, your friendly neighborhood Super7 will be there. Look kids! 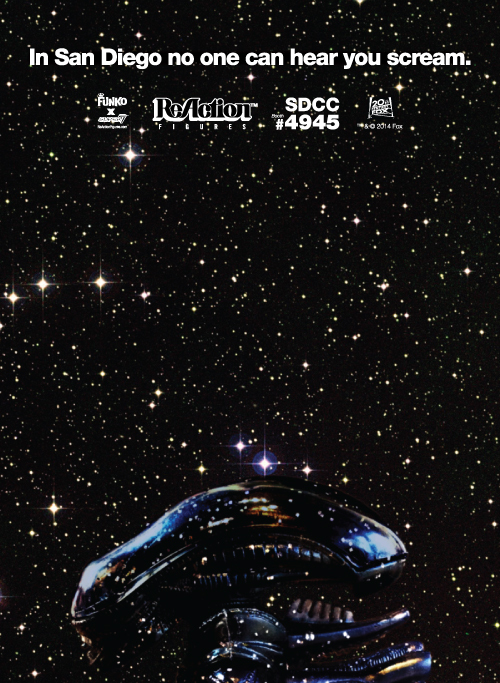 Now you can relive the excitement of the Nostromo Crew’s journey into the Derelict Alien Spaceship! Venture with Kane deep into the mysterious Egg Chamber ReAction Playset and pose your sturdy ReAction Figures on the detailed, egg-covered base. Inspired by the playsets of the 1970’s and packaged in an era appropriate photo box, the playset provides the perfect backdrop for all of your ReAction Adventures. 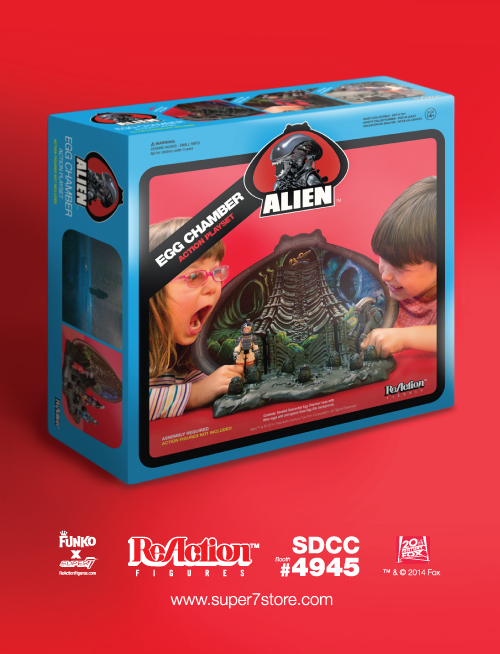 The playset comes complete with classically styled action base made from durable hand-cast resin and corrugated cardboard, full-color Alien Egg Silo backdrop that slides into the base for display. ReAction Figures sold separately. $100 each. From Deep Space comes a mysterious Alien Egg containing an unknown life form! Only by looking inside the hideously detailed egg can you find out what ReAction Figure lurks inside. Doubling as a blind box, each Alien egg contains an extremely limited, secret ReAction Figure. Hidden in these eggs are new sculpts and colors never before seen in the Alien universe. 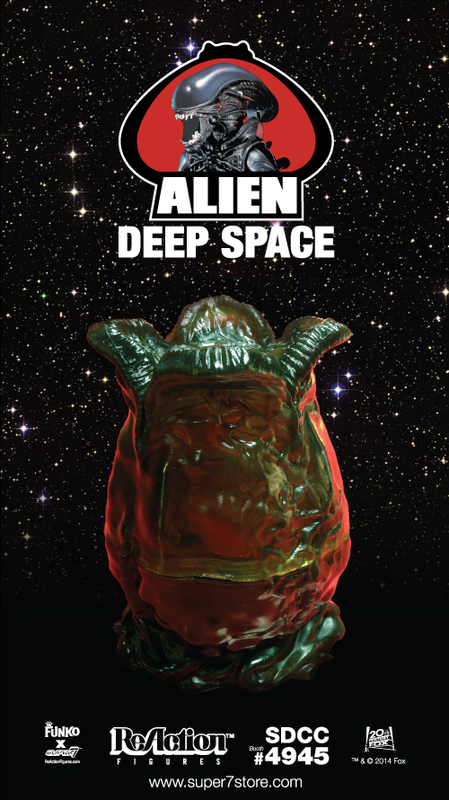 Once opened, the egg doubles as an action figure stand featuring a foot-peg to pose your ReAction Figure standing in the terrifying open mouth of the Alien Deep Space Egg! In space no one can hear you scream… $25 each. It’s time to Bring out the Gimp! One of the strangest characters seen in the cult movie phenomenon Pulp Fiction is being released from his basement dungeon as a poseable ReAction Figure! 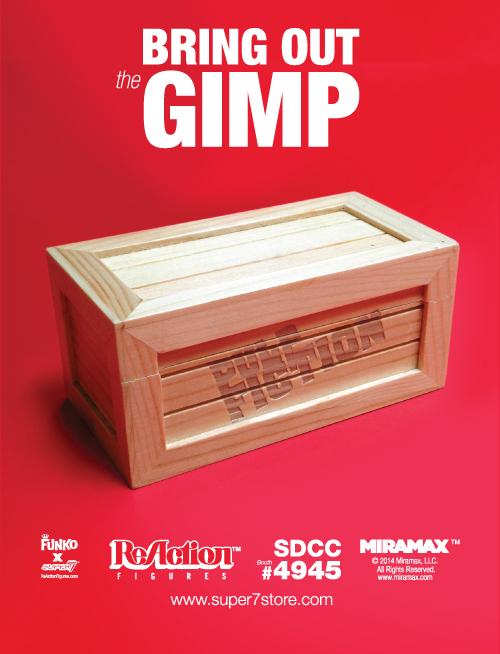 Now you can hide the Gimp away in your own authentically detailed wooden crate and bring him out to play when you need that special kind of release only he can provide. The 3.75” tall ReAction Figure features an ornately detailed outfit and comes packaged inside a wooden storage box. 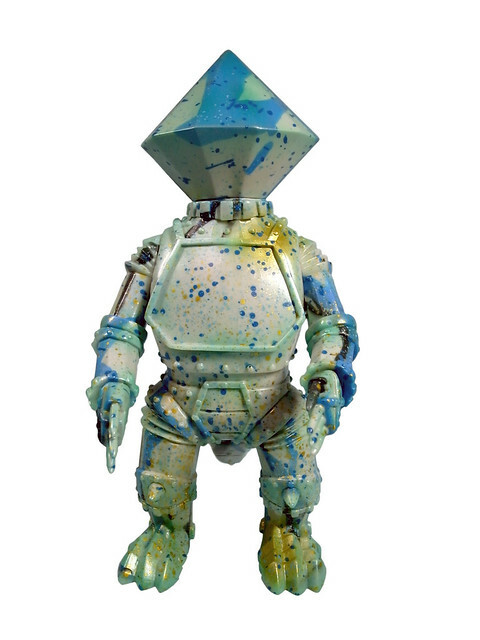 Bug Splattered Crystal Mecha – Crystal Mecha has been cruising through space at ludicrous speeds, colliding with all kinds of interstellar insects flying in his path! Cast in grey, blue, black, and glow-in-the-dark drip vinyl with paint splattered details – $95 ea. 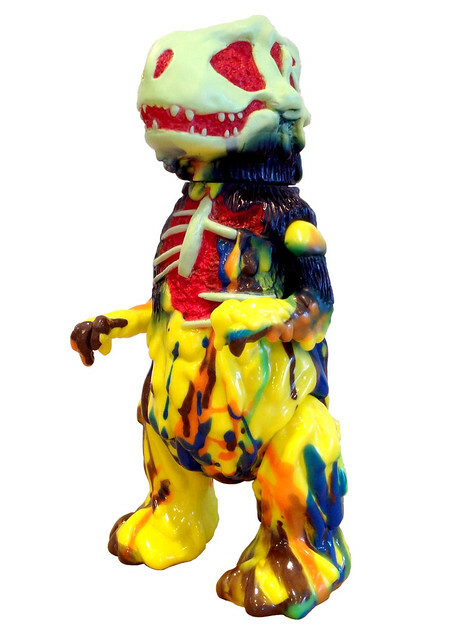 Radioactive Puke Fossila – Cast in vomit-inducing yellow vinyl with blue, green, brown and orange vinyl drip, and red, purple and bone colored sprays. $95 ea. Mummy Boy Adventure Set – Swap between the standard Mummy Boy, Pumpkin Boy and Keep Watch heads! Cast in marbled bright pink and silver glitter-embedded clear vinyl – $75 ea. The Incredible Eye Keep Watch Mummy Boy – In collaboration with our friends at Mishka NYC, the Keep Watch Mummy Boy is cast in marbled green and purple vinyl with silver, white, green and red painted details – $65 ea. Marbled Madness Mongolion – The Mighty Mongolion continues to raise the bar! Cast in marbled bright green and gold glitter-embedded clear vinyl – $65 ea. Zombie FrankenObake – In the dead of night, the Zombie FrankenObake rises from the grave in undead marbled blue and grey vinyl in a black vinyl suit! $65 ea. Ooze It Tribute Ooze Bat – Throwing back to the classic oddball toy that started it all, the Ooze Bat is cast in green vinyl with yellow painted details – $50 ea. 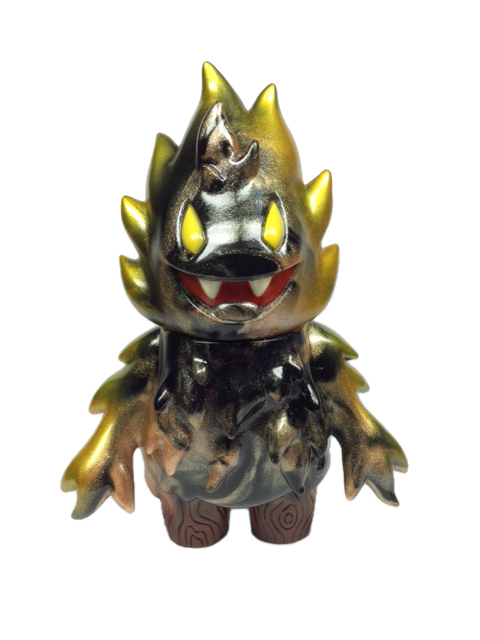 Volcano Fire Caveman Dinosaur – Not content to with his place in ancient prehistory, The Caveman Dinosaur clubs his way into the modern era in Fire Red Vinyl with brown, black and metallic gold sprays! $35 ea. Burnt Offerings Honoo – A mysterious fire burns deep in the woods, swirling in marbled black and metallic copper vinyl with yellow, brown and metallic gold painted details – $35 ea. 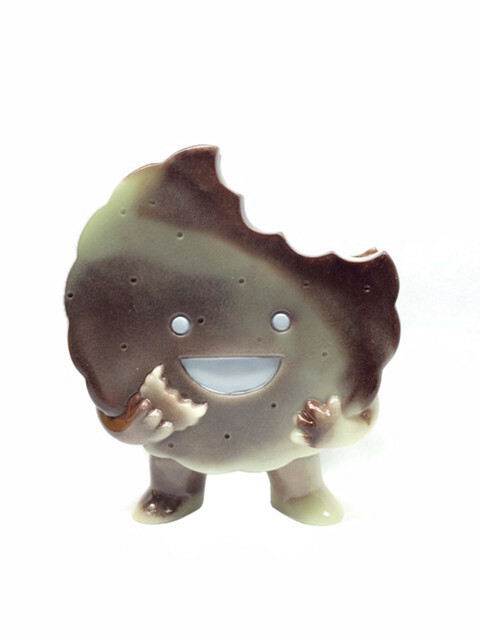 Cookies and Cream Pie Guy – Part of a trifecta of treats, Pie Guy is cast in delicious marbled brown and glow-in-the-dark vinyl with white and brown painted details – $25 ea. 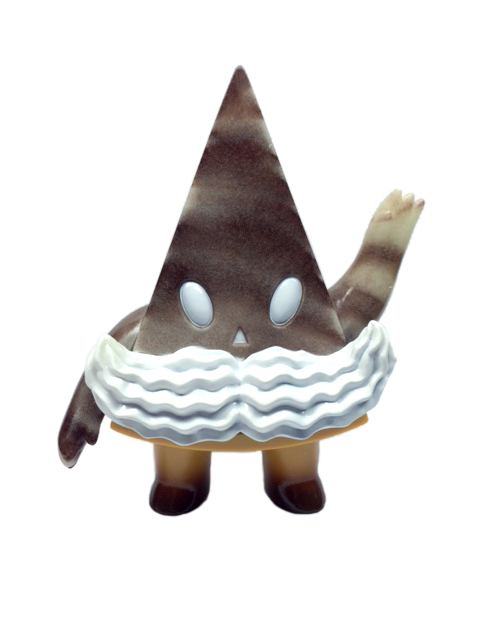 Cookies and Cream Foster – Part of a trifecta of treats, Pie Guy is cast in delicious marbled brown and glow-in-the-dark vinyl with white and brown painted details – $25 ea. 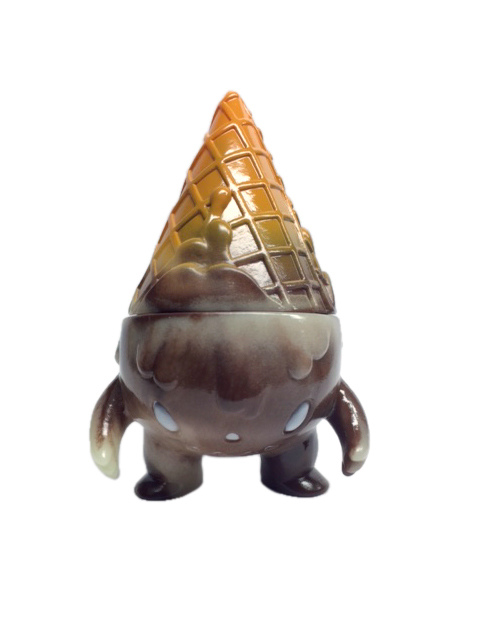 Cookies and Cream Milton – Part of a trifecta of treats, Pie Guy is cast in delicious marbled brown and glow-in-the-dark vinyl with white and brown painted details – $25 ea.